Our modern floor registers in the contemporary design are finished with a satin nickel colored faceplate. 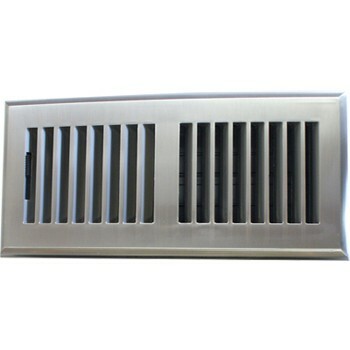 Totally rust proof plastic air vents are now an option for those looking for stylish registers for bathrooms or kitchens. The modern floor register shown here has a plastic damper which slides easily to open or close off the airflow in your room. Even though these are plastic air vents, they can endure up to 300 lbs of pressure, making them as durable as some of our metal registers. The entire modern floor register is constructed out of a high-impact resin plastic and can be used for both your heating and cooling needs. These plastic air vents will blow you away with their quality at a price that won't break your piggy bank. Faceplate is approximately 7/16" thick to allow for moderate foot traffic and can withstand 300 lbs of pressure. 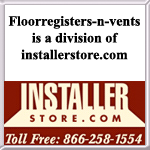 Tip: Industry standards for ordering plastic air vents is to get the dimensions of the hole size in the floor. Our 4 x 14 modern floor register will fit into a 4 x 14 sized hole. 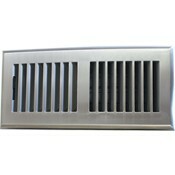 We also have plastic air vents in other finishes and designs for those who want to mix it up! Our modern floor registers are just perfect for rust proof floor registers that look good at a low price.